The Korean War has never really ended. Although a ceasefire agreement was reached in 1953 after three years of savage warfare, the conflict continues to simmer just below the surface, threatening at any moment to break into full-scale fighting. It makes the Korean peninsula one of the most dangerous flashpoints in the world today. But the war itself has long been called the forgotten war. It was fought at the height of the Cold War, with the forces of the United Nations, led by the US, on the one had against the forces of Communism on the other, led by Mao Tse Tung’s China. 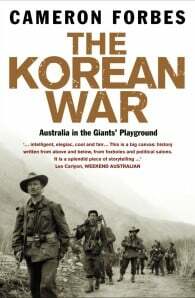 Australia was a part of the US-led coalition, and our troops took part in some of the conflict’s most savage fighting, but coming only five years after the end of World War Two, and before the full empowerment of the media that was to take place during the Vietnam War, what happened in Korea during those three long years has been largely overlooked by the public. Cameron Forbes, acclaimed author of Hellfire, tells the story of the war and Australia’s involvement in it in a riveting narrative. From the letters and diaries of those diggers who fought across Korea’s unforgiving hills and mountains to the grand strategies formulated in Washington, Moscow and Beijing, The Korean War reveals the conflict on all its levels – human, military and geopolitical. In the tradition of Les Carlyon’s Gallipoli and The Great War, Cameron Forbes has written a masterpiece that will serve as the definitive history of Australia and the Korean War. Cameron Forbes was born in Rockhampton, Queensland. He has been foreign editor of The Age, European and Asia correspondent for The Age and Washington correspondent for The Australian. He has reported wars and civil wars in the Middle East, Rwanda, Afghanistan and Bougainville. He has spent much time in that fascinating foreign country, Aboriginal Australia. He has received the Graham Perkin Journalist of the Year Award, the Canadian Award for Journalist Merit, the United Nations Association Media Peace Award and is the 2010 Walkley Award Winner for Most Outstanding Contribution to Journalism.